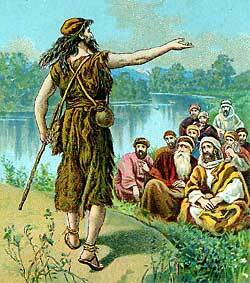 John the Baptist preaches that the Kingdom of Heaven is near. WHILE JESUS WASgrowing to manhood in the city of Nazareth, in Galilee, John, the son of Zacharias, was growing to manhood in the desert country of Judea. John spent much of his time alone in this desert country, listening to God‘s voice. And when he became a man he left his lonely home in the desert and began to tell God’s words to the people. John did not go to the cities of the land to preach God’s message, but stayed in the wilderness of Judea near the River Jordan. And the people came from every part of the land to hear him speak. There had been no prophet among the Jews since the days of Malachi, more than four hundred years before, and now everybody was eager to hear this strange preacher in the wilderness tell the words that God had spoken to him. They believed he was a prophet, sent from God, and they came in great numbers to hear his words. All classes of people came to John to be baptized by him. Among them were even the religious rulers of the Jews–the Pharisees and the Sadducees. These men were very religious, and very careful to appear righteous before others. But God, who looked into their hearts, saw that they were proud and sinful. God saw that they despised the poor unfortunate people who lived among them, and that they believed themselves to be more righteous than other men. And when they came to be baptized of John, God caused him to know that these Pharisees and Sadducees were only making believe that they were good. John taught the people who came to him that they should be unselfish, and kind to the poor. He told those who were rich to share their food and their clothing with the needy. He told those who were soldiers to harm no one, and to be contented with their wages. He tried in this way to teach them that God’s kingdom would be a kingdom of love and peace, and “good will toward men,” just as the angels sang to the shepherds on the night of Jesus’ birth. News of the strange preacher in the wilderness spread to even the farthest corners of the land, and everywhere the people were talking about his message. They were wondering whether John was the prophet Elijah come back to earth again, for John did not dress like other men. He wore only a rough garment woven of camel’s hair, and tied about his waist with a skin girdle. And he ate the simple food that he found in the wilderness, dried locusts and wild honey. And he was bold, like Elijah had been, and unafraid to speak the truth to even the wicked King Herod. But when John heard about the wonderings of the people, he said, “I am the voice of one crying in the wilderness, and warning you to prepare for the coming King. After me there is coming one greater than I–so much greater that I am not worthy to unfasten his shoes. And though I baptize you with water, he shall baptize you with the Holy Spirit, sent down from heaven. So John took Jesus into the River and baptized him there. When these two were coming up out of the water, suddenly the heavens opened above them and the Spirit of God, in the form of a beautiful dove, came down and sat upon Jesus’ head. And John knew by this sign who Jesus was; for God had told him that some day he would see the heavens open and the Spirit of God descend upon the coming King. After this time John continued to preach, and sometimes Herod heard him. Although Herod was troubled because John told him about his sins, his wife was much displeased with this fearless preacher of the wilderness. She wanted her husband, Herod, to kill him; and to please her, Herod shut John up in prison. This entry was posted in Discipleship and tagged Baptist, Christ, Christ Jesus, Elijah, God, Gospel of Luke, Gospel of Matthew, Holy Spirit, Jesus, John, John Baptist, New Testament, Religion and Spirituality, River Jordan, theology. Bookmark the permalink.